I’ve always liked the colorful look of chili peppers, the various colors and the way light shines thru their skins. We used to hang them up to dry and I have some fond memories of chilies hanging by the stove. My mother would wrap string around them or even sew them together. Usually we would have too many to eat so the extra would be saved this way and used as needed. As a child I wouldn’t touch them and even now hot food isn’t my thing. I like spicy but not hot. I planted some peppers the other day, maybe I’ll use them as my model in about 45 days. 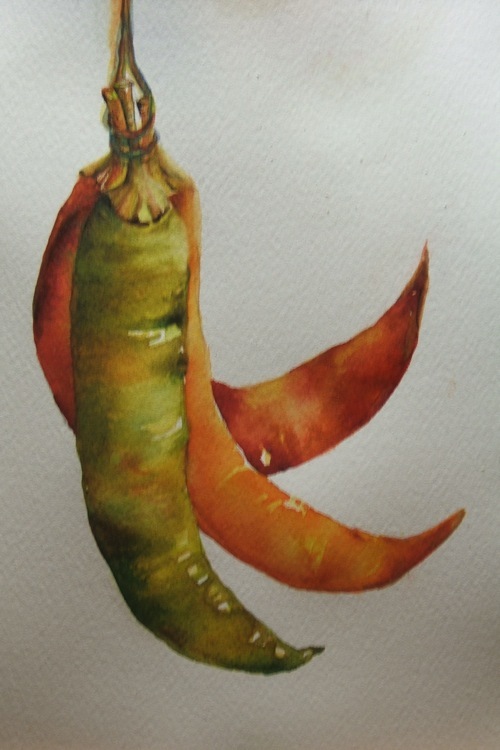 This entry was posted in A painting a day, painting, watercolor and tagged chili pepper, fruit, kitchen art, nature, plants, Still life, vegetables by shanti marie. Bookmark the permalink.